I know we have done a lot of individual reviews on a lot of these toys, but we also wanted to provide adults with a more comprehensive list of our favorite toddler transportation toys (ages 1 – 3). When it comes to toy planes, toy trains, toy trucks, toy cars, toy construction equipment, and everything else that moves, this list will help you find some great options! I know this goes without saying, but my sons and I haven’t been able to play with every toy train, car, or truck that’s out there. We have been able to play with a lot of them, so here is a list of some of our favorites. If you have had a great experience with some toddler transportation toys that aren’t listed here, please let us know! I know I’m always looking for more gift and toy ideas. Also the toys below aren’t listed in any particular order, they are just toys we have enjoyed! We have just updated this list for 2017! New toys are coming out all of the time – put some of these classics are must haves! #1. 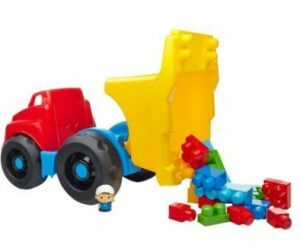 The Mega Bloks Dump Trucks. These are just really good all-purpose toys that can be used inside and out. They are fun to drive around and can be loaded up with all sorts of toys. There are lots of fun options to pick from, including John Deere and Caterpillar designed trucks! These dump trucks often come with a set of bloks. #2. The Little People Zoo Train. I love this toy because my son loves both animals and trains. The back can be loaded with different zoo animals and it makes all sorts of different sounds when pushed. More animals can be bought to be added to the standard polar bear and gorilla that come included. #3. The Little People Toy Airplane. This toy has one song that is plays over and over again when it moves that will annoy parents (it scored an 8 out of 10 on our parents annoyance scale). However, children that love airplanes will enjoy flying this toy around, hopefully not crashing into to many things. #4. Thomas the Train Sit and Push. All toddlers should have some type of sit down toy they can push on their own. This is a great option because it is easy for kids to sit down on and move, but also easy for parents or kids to push. It also has numerous buttons to push, makes all sorts sounds, and even has a hidden compartment to hide things in. Great for any Thomas the Train fan! #5. 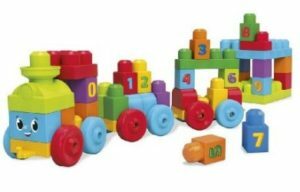 Mega Bloks First Builders 1-2-3 Learning Train. This is a mixture of a transportation toy and a building toy. This is normally a 50 piece set, with 3 of the pieces being moving platforms with wheels. What is nice about this is it gives your child the ability to create their own train. The block train will move pretty well, and if you own more mega bloks the train set will probably become incorporated with the rest of the collection. #6. Walmart brand Pull Back Monster Truck Set. This is a fun set of 2 monster trucks with 2 alternative tops you can put on the top of the trucks to change colors. They are a pullback toy, so they will move on their own. The key here is just teaching your toddler the best pull back push forward techniques to maximize speed. I also recommend teaching them how to build ramps out of blocks and books to bring as much enjoyment as possible. #7 Green Toys Airplane. Kids who love airplanes are going to enjoy playing with these colorful toy planes. It doesn’t do anything crazy special, but as a parent I love supporting a toy company that makes there product in America and from 100% recycled materials! You have two color choices in red and blue. 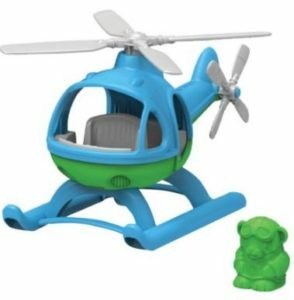 #8 Green Toys Helicopter. This is another fun flying toy that is made from 100% recycled milk jugs! It comes in two blue/green color schemes. Included is two spinning rotors and a little green plastic bear pilot. It is durable enough to survive those unfortunate toddler crash landings. #9 Cartoon RC Fire Truck. This toy is recommended for children 18 months and older, and is about 6 inches longs and 4 inches high. It is remote control operated, with both forward and reverse possible. The control is easy for kids to use, and there are the toy blinks and plays music when the right button is pushed. The truck requires 3 AA batteries and the remote requires 2 AA batteries! Unfortunately, batteries aren’t included! #10 Little People Lift ‘n Lower Fire Truck. I am a huge fan of Fisher-Price’s Little People Toys and this is another winner. With a recommended age of 12 months to 5 years, this fire truck makes over 25 different sounds/songs! It comes with two fire fighters and a fire dog, and they can climb up and down the fire ladders to activate lights and sounds. Pushing the toy is easy to do and also makes noises. It can get a little annoying for parents over time, but kids love it! #11 Melissa & Doug Stacking Train. I am not sure if this is technically a train toy or a block toy, but my son really likes it. He loves pulling the 3 piece train around, but he also really likes stacking all of the removable blocks into a large tower or stacking them back onto the train. Either way, this is a really solid toy for kids. #12 V-tech Sit to Stand Alphabet Train. This toy is best for child 1 to about 2 1/2 years of age. It has 3 ways to be played with, a floor mode, riding mode, and walker mode. This is nice because your child can grow with this toy. It is loaded with extras like 26 letter blocks, piano keys, and a book. Great all around transportation and learning toy! #13 Green Toys Train. This bright and colorful train set comes with 3 carts that can be connected and disconnected. The open cart is perfect for pulling additional cargo around. It comes with two toy conductors and you can pick from green and pink or blue and red! #14 John Deere Animal Sounds Hayride. This is great for toddlers that love tractors, animals, or both! The tractor pulls two carts, and it comes with 4 animals and a farmer! The toy signs Old MacDonald, and when you place the toy animals into the correct spots in the hay carts, it makes the corresponding animal sound. 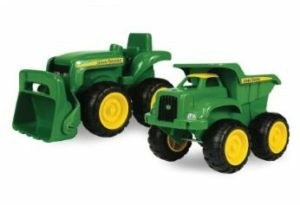 #15 John Deere Sandbox Truck and Tractor Pack. As the name implies, this is a great outdoor transportation toy choice. You can scoop up sand with the tractor and dump it into the truck, what kid wouldn’t enjoy doing that for hours. #16 Fisher-Price Little People Tow’n Pull Tractor. This fun toy has a tractor pulling an open wagon, and it comes with a farmer, pig, and cow. The pig will pop up and down as the tractor moves, which kids really seem to enjoy. It makes lots of fun noises, and the batteries are included! #17 Fisher-Price Little People Lil’ Pirate Ship. This is a really fun toy that will allow toddler’s to use their imaginations, especially if they like TV shows like Captain Jake and the Neverland Pirates. It comes with a pirate, working cannon, parrot, and of course a cannon ball you get to fire from the cannon! #18 Green Toys Rocket Ship. Does your toddler like space? 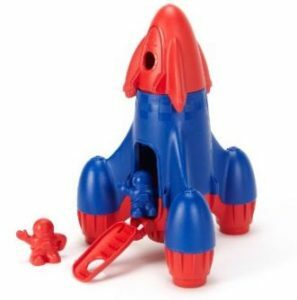 This really fun rocket ship comes with 2 astronauts, and is built from 100% recycled materials. The red and blue design is really eye catching, and toys that encourage using your imagination are always a big hit in my household. #19 VTech Drop and Go Dump Truck. This is great for children 6 months to about 2 years. It comes with 3 rocks, and when you place those rocks into the back of the dump truck it counts them for you! A great learning toy, but one that will probably become outdated as your child grows older. #20 Cartoon Friction Powered Play Vehicles (Set of 4). This is a great play set for children 18 months and older. Made from durable plastic, they are good indoor or outdoor toys. The set of 4 can be bought at numerous online stores, and comes with a tractor and wagon, bull dozer, dump truck, and cement truck. #21 Best Choice Products Excavator Digger Scooter Pulling Cart. This toy has a manufacturer’s recommendation age of 18 months to 5 years. This is great because your child can sit on it and push it around with their feet, and use the arm digger. There are also lots of buttons to push that make noise, and the seat lifts up for a hidden storage compartment (for some reason this type of feature is my son’s absolute favorite thing). #22 Battat Garbage Truck. 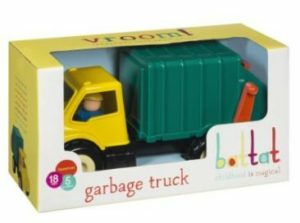 This is just a great looking garbage truck toy. It is good sized and has lots of working parts, levers to pull, doors to open, basically all of the good stuff you would want to see in a garbage truck toy. It even has a removable driver. This company also makes a similar dump truck, fire engine, front loader, and cement truck that can be purchased. #23 VTech Go! Go! Smart Wheels Cement Mixer. This is a fun toy for children 15 months to 2 – 3 years. Your child will be able to push this toy all around, and it has 8 or 9 different songs that it plays. It also has lights and sounds, making it a solid choice for younger children. #24 11” John Deere Tough Tractor. This is just your classic toy tractor. It doesn’t have all the fancy bells and sounds, but it reminds me of all the toy tractors I had growing up. I like this for the nostalgic feelings it brings back to me! 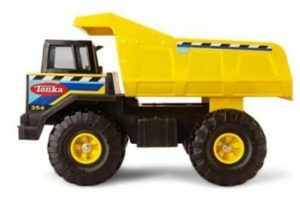 #25 Tonka Retro Classic Steel Dump Truck. This is another one I’m including on the list, well, because I think we all had this toy growing up. It is nothing fancy, just your classic heavy duty metal dump truck. It has a manufacturer’s recommended age of 0-7 years, I had no problem with my 2 year old son playing with it, but watch them since it is heavy and can be rammed into lots of things. #26 Tonka Classic BullDozer. This toy should be used by kids closer to 2 to 3 years of age, just because there are some small parts that could become choking hazards if they are broken off. It is another classic Tonka toy that doesn’t do anything special, but is built to last for a very long time. 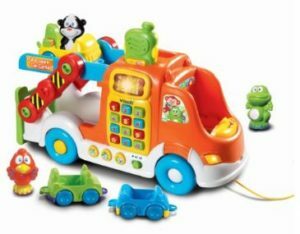 #27 Playskool Play Favorites Rumblin Tow Truck. This is a fun truck that zooms off when you push it around, and when you pull the tow hook it rumbles. Great toy for crashing into other toy cars with, and the bright colors make it fun for young children. 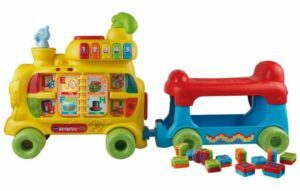 #28 VTech Pull and Learn Car Carrier Pull Toy. VTech is known for making educational toys, and this transportation toy is perfect for children 12 months to 3 years. There is a pull string where you can pull it, and you can also push it around. It comes with 3 animals and 3 little cars that can be loaded up onto it. Lots of educational buttons that can be pushed as well. #29 Kid Connection My First Vehicle Fire Truck. This is a really good fire truck toy for children around 2 years of age. It has plenty of lights and sirens, can be pushed around really well, and should bring your toddler plenty of enjoyment. #30 Fisher-Price Amazing Animals 101 Dalmatians Rollin’ Round Fire Truck. This is really good for children ages 6 months to a couple of years. You can push it around to make fun noises, and of course, it is going to make puppy sounds. In the future we will release our list of top pre-school to kindergarten or so transportation toys (ages 3+). There are some that were borderline close to making this list, but I wanted to keep this list specifically geared towards toddlers, and manufacturer’s recommendations that started under the age of 3. We hope this list of toy trucks, cars, trains, rockets, construction equipment and everything else provided you with some great gift ideas. We also hope you have as much fun playing with these toys as we did. If you do have any questions, comments, or concerns, please let us know, feedback is always appreciated!